If brands were to allocate their marketing spend better they could realise about $45bn (£34.2bn) more profit globally each year, a study by Ebiquity published today at Cannes has shown. The research compared spending against allocation data to reveal insights into how marketers could be distributing their advertising budgets more optimally to generate growth in bottom-line profitability. The study analysed around 2,500 campaigns over a period of three years, and was regionally weighted in order to build a global number. It focused on channels where the profit impact at different spend levels could be analysed, namely: TV, radio, press, out-of-home (OOH), digital display, and digital video (including broadcaster video-on-demand and other internet video-on-demand, such as YouTube). This research builds on the recent Radiocentre and Thinkbox report findings into the allocation of budget spend against media channels, but this is the first time that a single global figure has been calculated. The analysis focuses on channel mix as opposed to other factors that are causing loss to advertisers, such as ad fraud, viewability, bot traffic, and other non-working media costs. The total media investment analysed was $375bn in global ad spend, or roughly 76% of the total global advertising market. Ebiquity found that if that same spend had been optimised based on the ROI contributions of each channel, it would have generated an extra $45bn in global profits for brands. "This research shows that brands could be delivering much more from their advertising investments. We’re highlighting that with proper measurement and analytics, marketers can reevaluate their spend allocation to dramatically improve results." Mike Campbell, head of international effectiveness at Ebiquity, whose team conducted the research in-house, said. 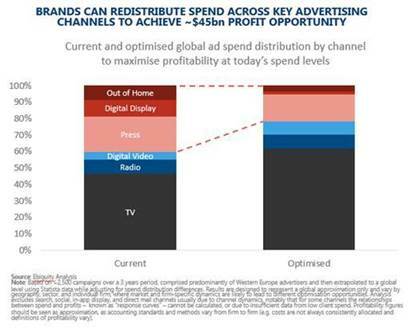 This can be achieved through an increase in spend in TV, radio, and digital video channels (see chart above). This reallocation, Ebiquity posits, "could increase overall marketing ROIs from 2.83x to 2.95x, an increase of over 4% – thereby delivering an extra $45bn in profits derived from marketing spend". 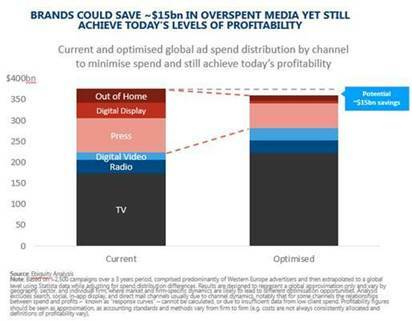 Further, Ebiquity claimed that brands are overspending on media by about $15.3bn (see chart below). The study argues that brands could cut this much in media investment and continue to deliver the same level of return. To achieve this, money would need to be reallocated from press, digital display, and OOH into TV, radio, and digital. "As media, content, and customer experience options proliferate, brands fundamentally need to know what works well for them and what doesn’t. 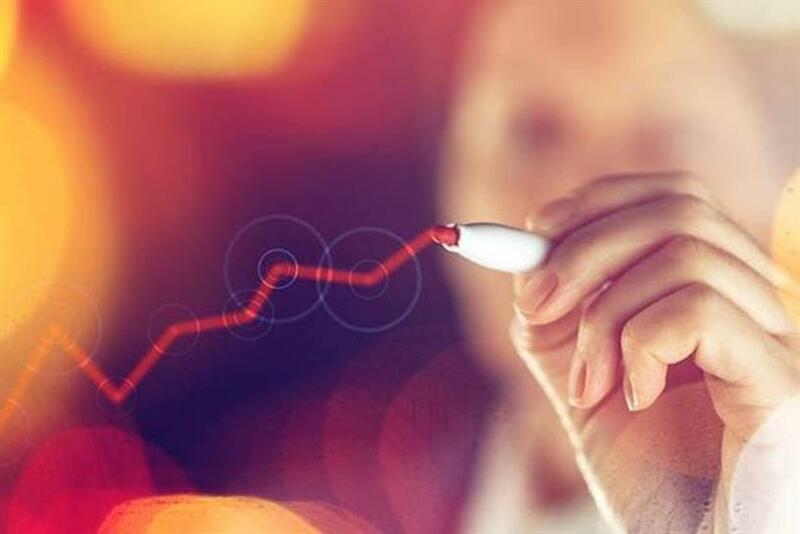 This study is an important reminder that marketing spend still has a positive bottom-line impact and should be treated as an investment, not as a cost," Michael Karg, chief executive at Ebiquity, added. Does blockchain offer a solution to media's transparency problem?